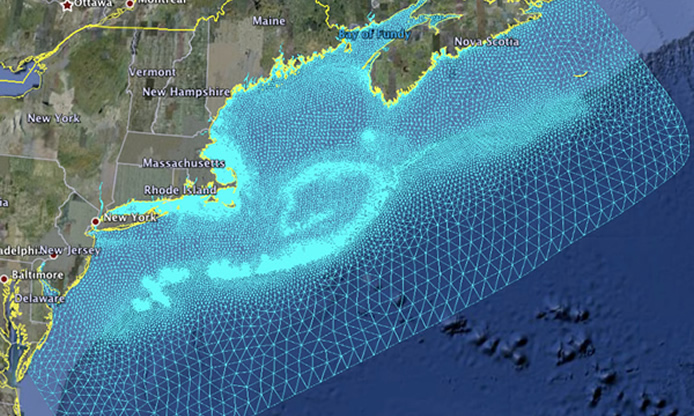 The GOM-FVCOM domain is used for the third generation version of the regional Gulf of Maine (GOM), Georges Bank (GB) and New England Shelf (NES) FVCOM with nesting to Global-FVCOM, Mass-Coastal FVCOM, and coastal inundation FVCOM models. The domain covers the GoM/GB/NES region and is enclosed by an open boundary running from the Delaware Shelf to the Nova Scotia shelf. The horizontal grid has a resolution (measured by the length of the longest edge of a triangular cell) that varies from 0.3 km to 15 km over the entire domain. Over GB, the resolution is 0.5-1.0 km over the steep northern flank, 2.0-3.0 km over the crest, and 1.0-2.0 km around the shelf break region of the southern flank. The resolution in the BF ranges from 0.5 km inside inlets to 2.0 km along the coast and 4.0 km in the interior of the Bay. Over the NES, the resolution is 0.3-0.5 km. The vertical grid discretization is implemented using a hybrid terrain-following coordinate with a total of 45 layers. In regions with depth greater than 225 m, 10 and 5 uniform layers with a thickness of 5 m are used near the surface and bottom respectively. In regions of depth less than 225 m, a sigma distribution with a uniform layer thickness is used. The coordinate transition thus occurs smoothly at a depth of 225 m where all layers have a uniform thickness of 5 m. This hybrid coordinate allows us to better resolve the surface mixed layer and bottom boundary layer dynamics over sloping topography while maintaining the vertical resolution in the shallow shelf and coastal regions. Click the play button or link to play the animation.